Magical Properties/Powers: Peace, love, overcoming alcoholism and other addictions, healing, courage, happiness, overcoming insomnia, psych-ism. Amethyst, a purple crystallized quartz, is a highly spiritual and magical stone that has not lost its popularity for over two thousand years. It is known as the stone of peace for it has no negative associations or side effects. Amethyst is used to transcend one to a higher consciousness, showing us the spiritual connection we have with all things in the universe. It aligns our thoughts with what is truly important to us and keeps us focused on our goals and purpose. It is often worn or placed on the altar during spiritual contemplation and meditation. Amethyst replaces fear, guilt, and self-deception with feelings of courage, hope, and inner harmony. Perhaps this is one reason it is often referred to as the sobriety stone. Actually, the word amethyst comes from the Greek amethystos, literally meaning “not to be drunk”. In Graeco-Roman times magical cups and wine goblets were carved out of amethyst in hopes that at least it would prevent the drinker from becoming drunk and at best cure cases of alcoholism. It was thought that all who drank from the amethyst cup would be rid of depression and evil. Amethyst also aids in recovery from other addictions, whether substance or behavioral, as well as emotional distress and depression. 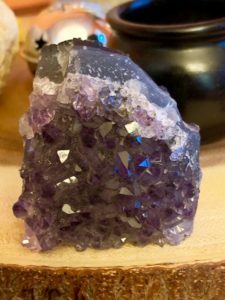 It is accepted in many circles that alcoholism/addiction is a spiritual sickness, so it comes as no surprise that amethyst, a stone full of deep spiritual energy, has been thought to aid in overcoming this illness for centuries.